There has been a radio station at Gilwell Park for some decades, certainly dating back to the 1970s. It has been located in several different locations around Gilwelll park, most notably in what is now the maintenance offices opposite the Woodlands Field and more recently on the end of the Storm Hut in what used to be the leaders room. In 2004 the Storm Hut had to be demolished owing to it's deteriating condition and the radio station went into storage until a new permanent location could be found. During this time the station operated from various temporary locations for large events - either from a tent or from the Gidney Cabin. The campsite has several different callsigns and these have included G8WGP and G0SWN. 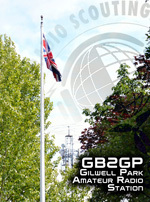 In the 1990s application was made, and granted, for the permanent special event callsign GB2GP to be assigned to the station. In 2007 the new extension to The Lid was completed (The Lid is a large agricultural barn used for indoor climbing and archery, with a large store and now offices and 2 classrooms). Once the additions were completed plans were made to house the radio station in one of the two classrooms. Although this is not a permanent shack in sense of the old shack at Gilwell, the radio station once more has a home, and it is possible to run the radios by remote control from anywhere with an Internet connection. For large events the station is run from the classroom or from tents on the lawn immediately outside the classroom. This allows the station to connect to the permanent aerials, including the beams located on top of the communications tower. For other occasions it's possible to set up a remote station in the CIC, for example, and still access the radios connected to the aerials in The Lid. It's intended to run Communicator Badge activity courses from Gilwell Park in the foreseeable future, as well as Novice and Intermediate Radio courses in due course. Watch this space for more information, or email us if you are interested and would like to be informed when these courses are planned.